Hello! I was playing with some challenges and came up with this card using the same image three times on the card. 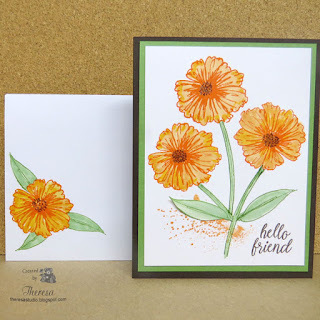 I stamped the flower from GKD set A Year of Flowers by Melanie 3 times on white CS with SU Only Orange and colored in with Copics. 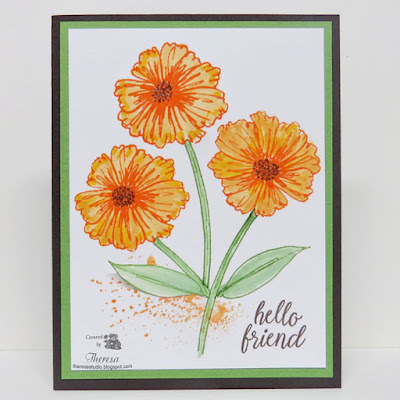 I used the leaf and stems stamps from the same set with Memento Bamboo Green ink and a sentiment from GKD Hello Friend with Memento Rich Cocoa ink. The splatter was done with GKD Tiny Texture stamp. I attached the image on a mat of GKD Green CS and then a base of GKD Brown CS. I made an decorative envelope to go with the card using the same flower and leaf stamp and inks. I also decorated the back of envelope but did not photograph that. Stamp TV: Gina K Designs Release Party Challenge-create a card using the same image 3 times. 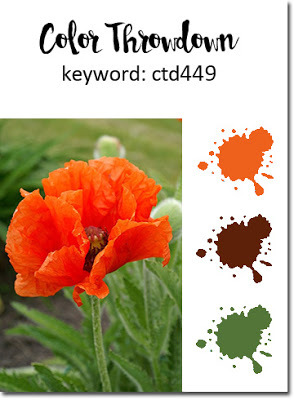 Color Throw down: CTD449 Use Orange, Green, Brown. Hello! 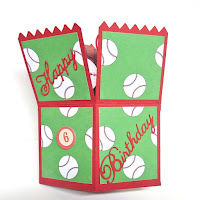 I recently made this Pop-Up card for my great-nephew's 6th Birthday. I cut the elements with the Cameo using a Silhouette file. Digital Patterned Papers were printed and used with Red Cardstock from stash. 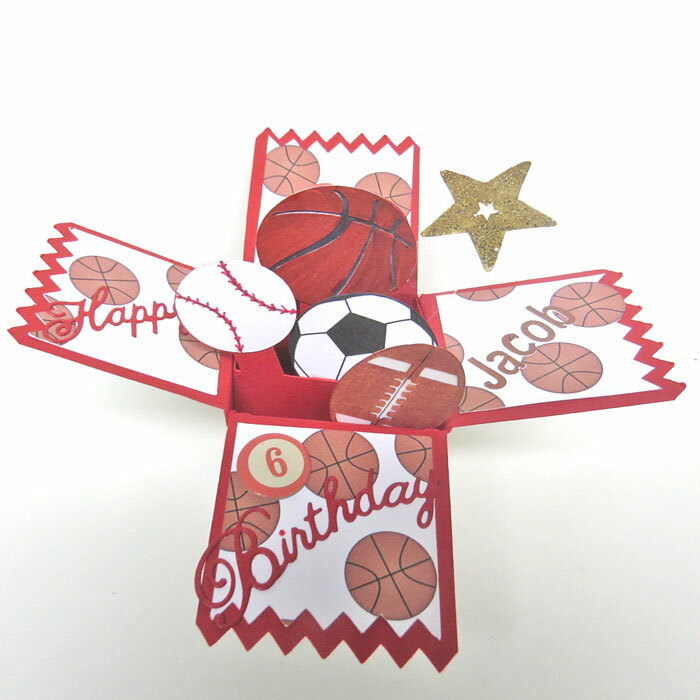 Added a Gold Star covered with glitter glue and preprinted "6" die cuts. Happy Birthday words were cut with Cheery Lynn Dies. Some of balls were colored with Copics and some were cut from colored CS. Hello! I am trying to enter some of June's challenges before time runs out. Making up for some time that I missed making cards lately. And I did have some problems with cards automatically showing on Facebook via Net Work Blogs but that seems to have been corrected. 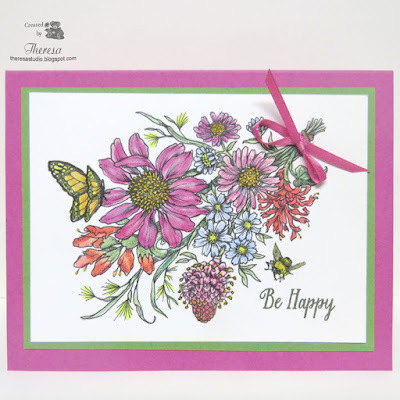 This card is made with Power Poppy Pure Prairie Bouquet digital stamp. After printing the image I colored with Copics and simply placed on a Green CS mat and a base of Purple CS. I threaded the ribbon through slits and tied into a bow before attaching to the mat. 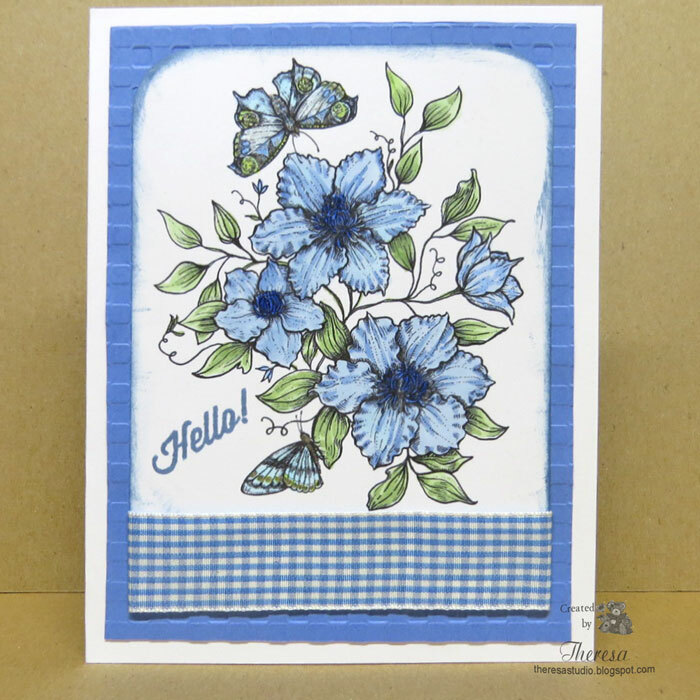 I stamped the Power Poppy sentiment from Geraniums set with SU Always Artichoke ink. Since I wanted a bee on my card I printed just the bee from PP Bees in Foxglove digital set ....fussy cut, colored and glued to the finish card. It would have been easier if I had thought to print the bee with the image of the bouquet but I like doing things the hard way! Thought I needed that Bee with Be Happy sentiment. 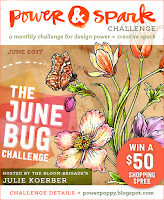 Power & Spark Challenge: The June Bug challenge-use a bug on a card. Really Reasonable Ribbon Challenge: #166 Summer with Ribbon. My flower, butterfly and bee remind me of summer. 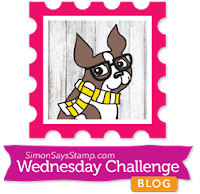 Simon Wednesday Challenge: Simon says Any Thing Goes. Hello! 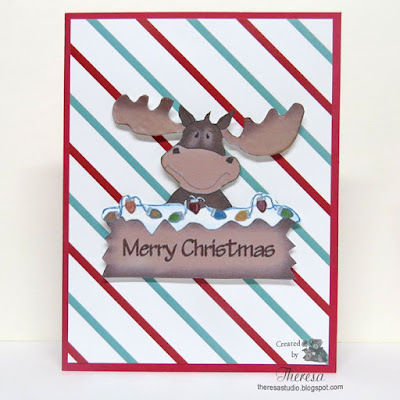 Yes another Christmas Moose! 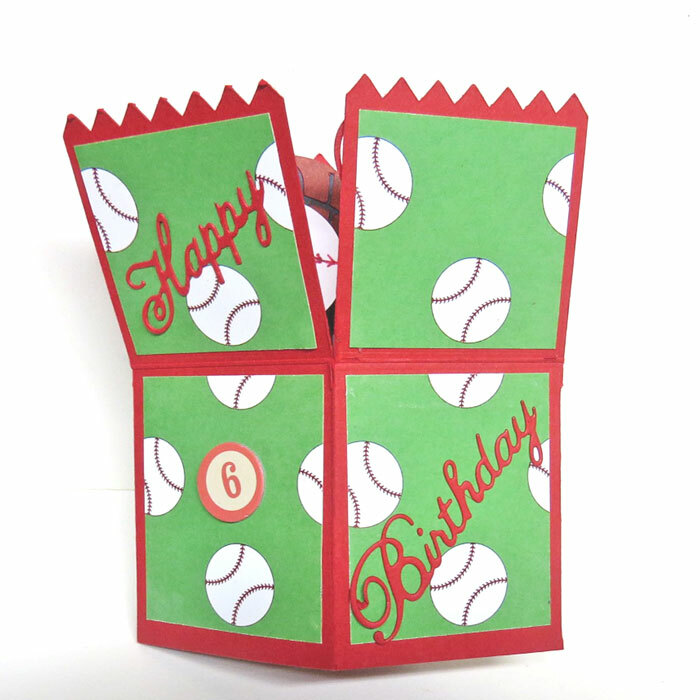 I just could not resist using this cute face on a card! I simply printed and fussy cut the digital image and popped up with foam tape to a layer of pattern paper from Paper Sweeties Merry & Bright pad and to a Red card base. Added some glitter to the string of lights and some Matte Accents to his antlers for texture and shine. 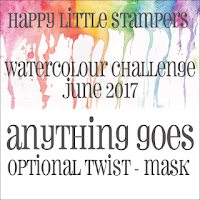 Craftyhazelnut's Christmas Extra Challenge: June Challenge is anything goes. 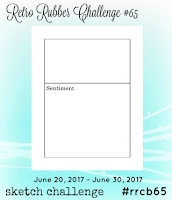 Craftyhazelnut's Patterned Paper Challenge: June Challenge is to use patterned paper. 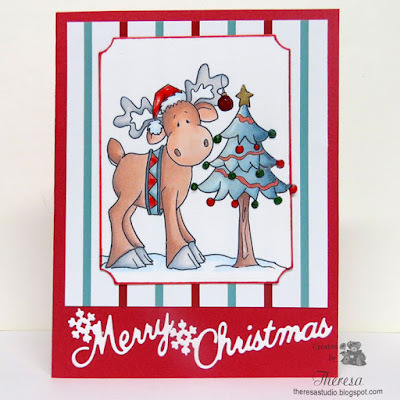 Bear with me as I will be repeating a lot from my last Moose Card post in posting this Christmas card. I found that I have several cute Moose images and am not sure the origin of this one. I used more of Paper Sweeties Merry & Bright paper pad with Red CS and cut the words from White CS using Cheery Lynn Dies. 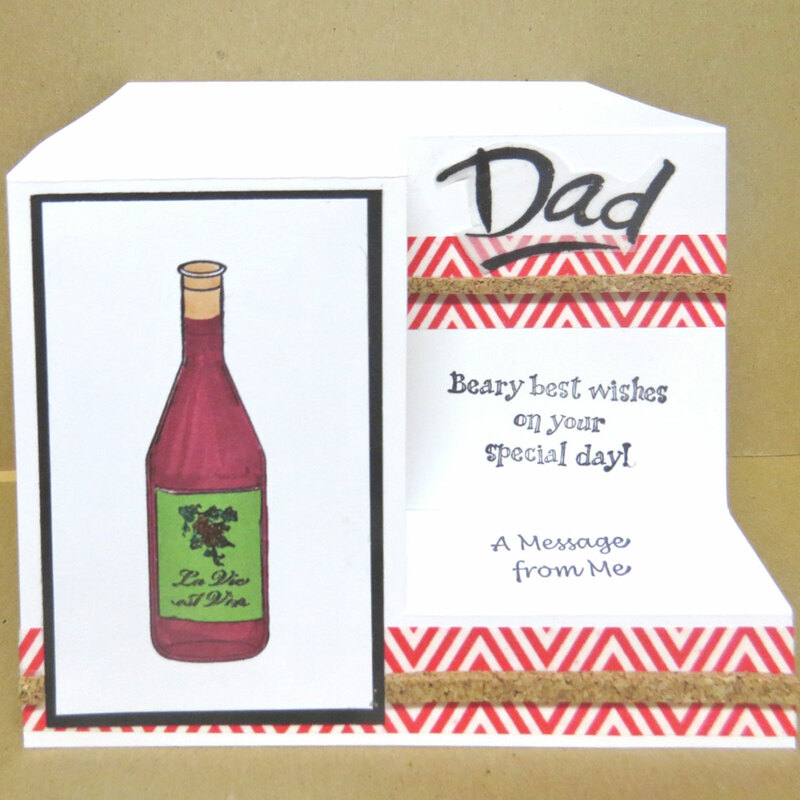 I trimmed the printed image with a Spellbinders die and edged with a Red Copic marker before assembling the card. I used Red and Green Nuvo Crystal dots on the ornaments. Do you have memories of beautiful summer days driving through country roads and covered bridges? What great times they would be ....carefree and lazy....without a worry in the world. This scene reminds of one of those times. 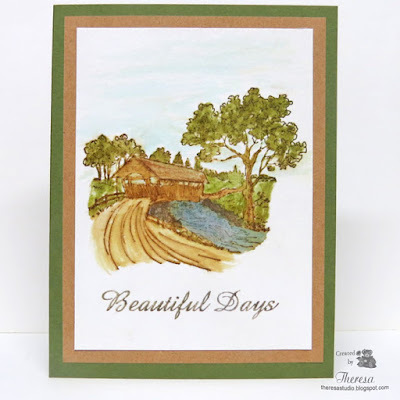 I stamped the image with Repeat Impressions Covered Bridge stamp using a light brown ink on watercolor paper and water colored with distress inks using a water brush. I won't go in to all the details of how I did the coloring but I did do repeated stampings using the Misti throughout the process. I colored this panel a few weeks ago after studying some water color techniques online and it has been on my desk waiting for further attention. I finally decided to simply trim the panel and adhere to a mat of Khaki CS and a base of GKD Green CS. 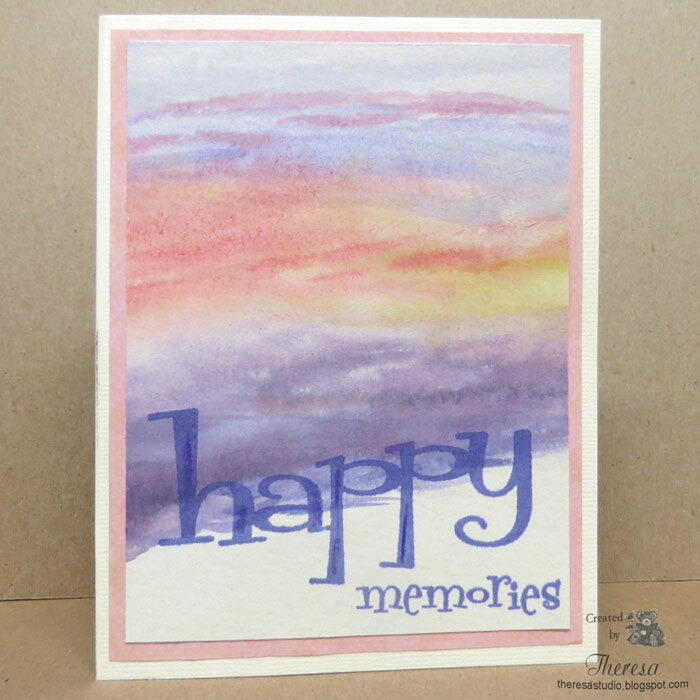 Stamped a portion of a Repeat Impression sentiment with Memento Rich Cocoa ink to finish as a card. 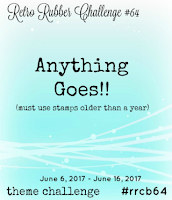 The House That Stamps Built: Anything goes challenge-J2817, Used Repeat Impressions stamps. 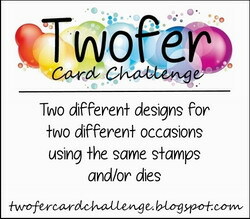 Crazy 4 Challenges: C4C391-use some form of water on card. Water is flowing under the covered bridge. Hello! 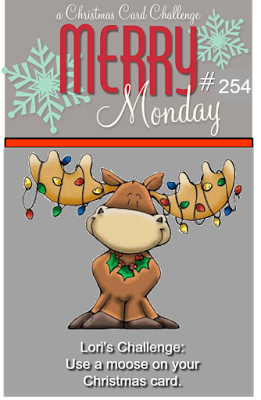 Thought I'd make a cute Christmas card for this week's Merry Monday Challenge -to use a Moose on your card. 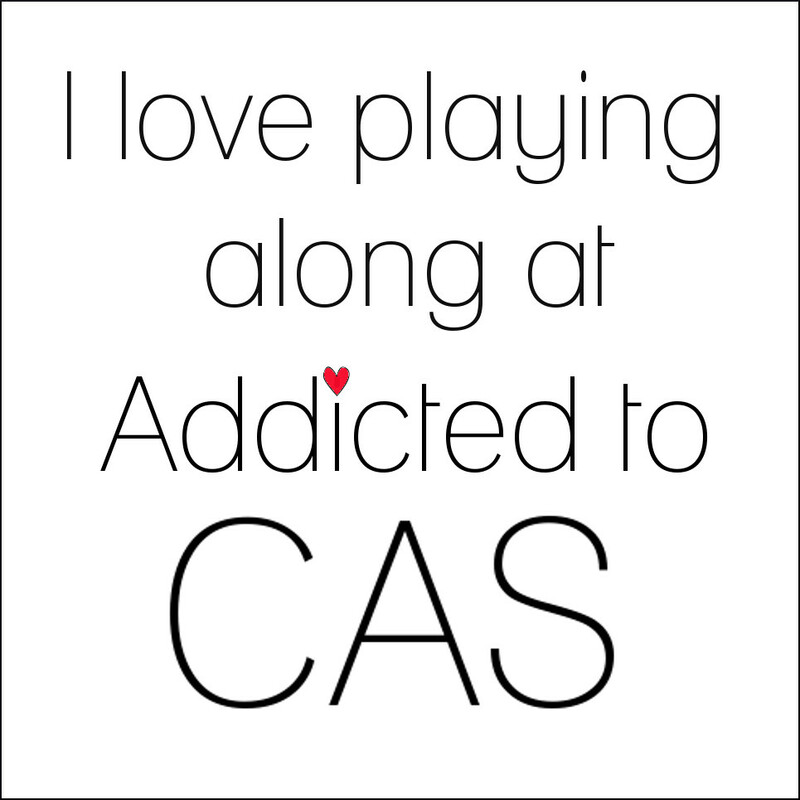 I had this cute image in my Silhouette cut n print files from Stinky Cute. The color was a bit off in the print out but I just found some pattern paper from Paper Sweeties paper pad that picked up the same hues. I kind of like the final result. I added some texture and sparkle to the image with Sukura Clear Star pen, Stickles Crystal, and Ranger Liquid Pearls. Also edged the sentiment with a glitter pen. I edged the image with a Red Copic marker-gives the look of another layer without the weight and attached to a mat of the pattern paper and then to a red card base. Hello! 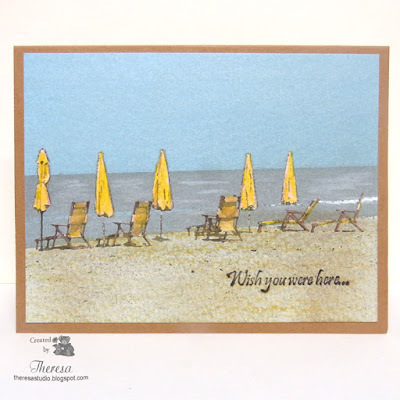 My card today was created with a photo that I made at the beach on Captiva Island last year. I thought it would make a great card with a few enhancements made with Photoshop making the photo appear as a watercolor. I printed the photo on watercolor paper after doing some editing and eliminating the blackbirds. 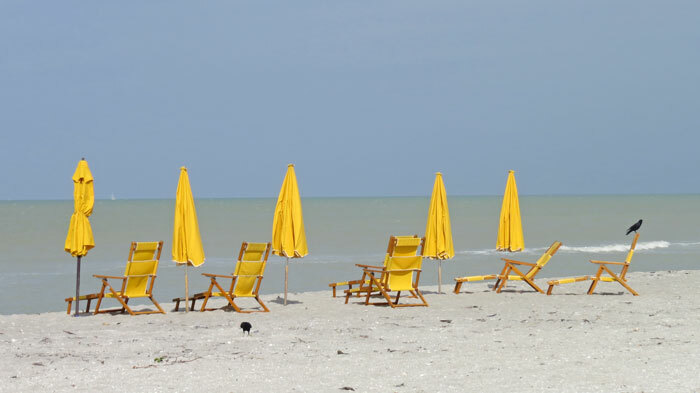 (see original photo below) I added some color highlights using color pencils on the sand, beach, umbrellas, and chairs. 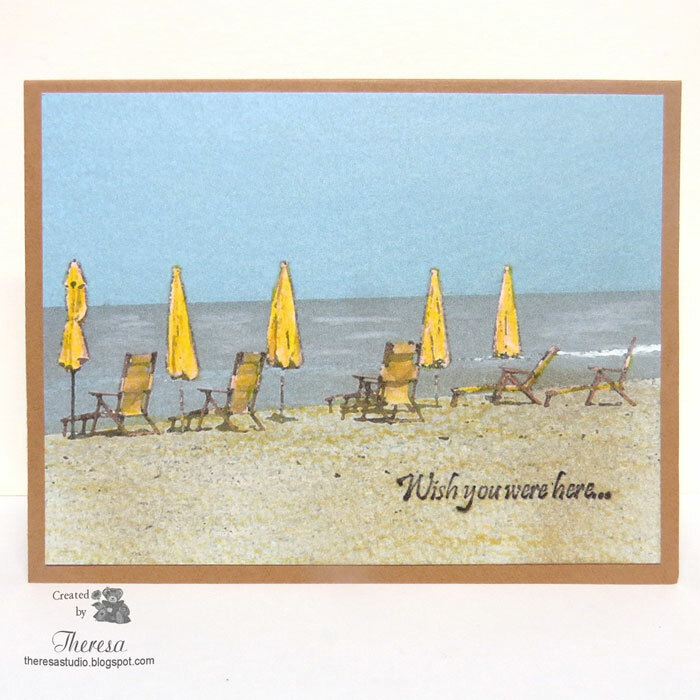 I stamped a GKD sentiment with Memento Espresso Truffle ink and adhered the image to a GKD card stock to finish. 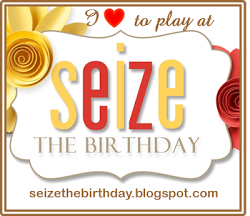 I really enjoy creating cards with my own photos as well as stamping and coloring images. 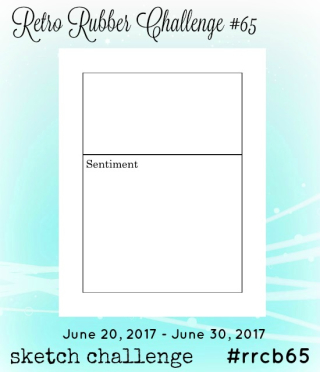 I hope this card is considered for the challenges that I am entering even though it was made with only one sentiment stamp. 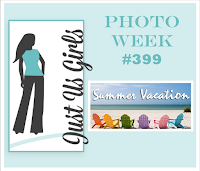 Just Us Girls Challenge: #399 Photo Week-Summer Vacation. The challenge photo reminded me of my photo below so I used it to create my entry. 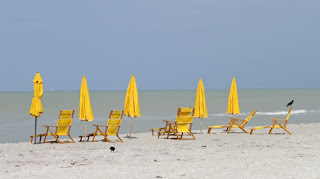 Make My Monday: Challenge #49 Summer Brights---bright yellow and bright blues from a sunny day. 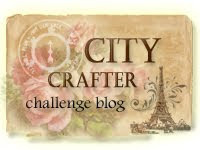 Crazy 4 Challenges: C4C 391 Include some water on your card. angles over the past few years. This was one of my favorite artistic shots. Summer finally arrived last week! 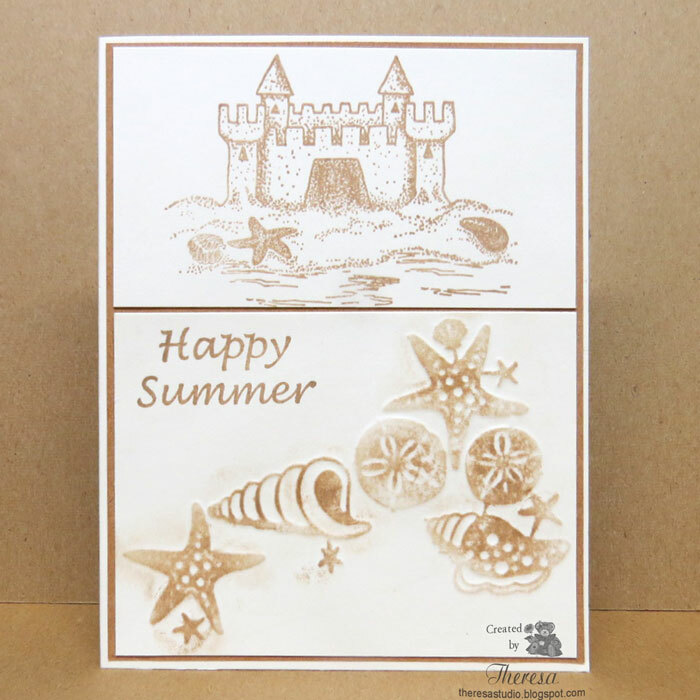 With that in mind, I created this summer theme card using the Sketch below from Retro Rubber Challenge #65. 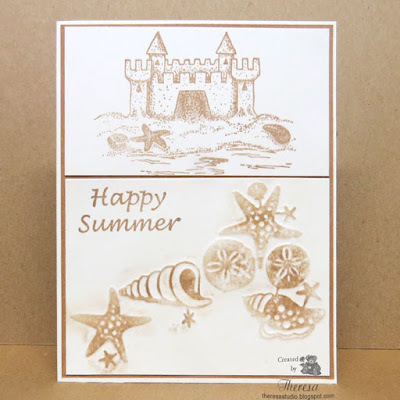 It turned out being monochromatic since I only used Memento Toffee Crunch ink for stamping the Repeat Impressions Stamps (Sand Castle and Sentiment) and also for sponging the raised areas that I embossed with Spellbinders Impressabilities Sea Scape. 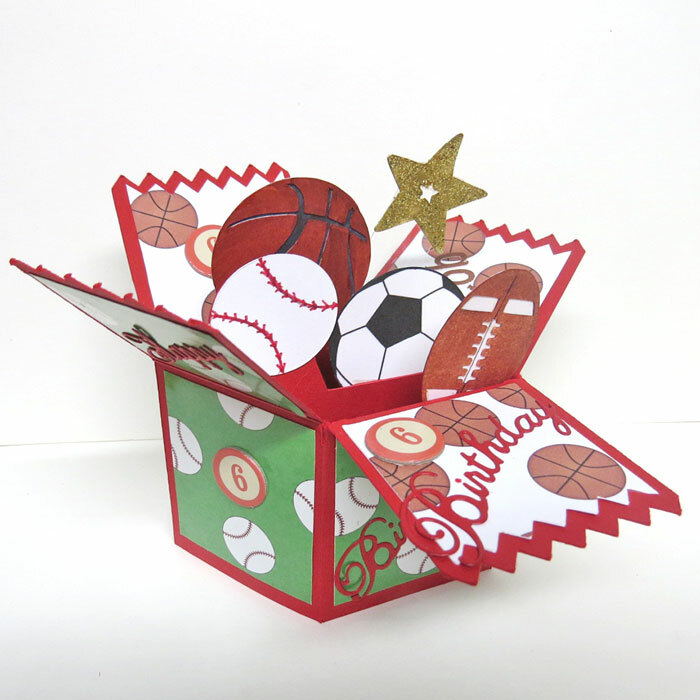 I used Kraft and Ivory Card stocks. 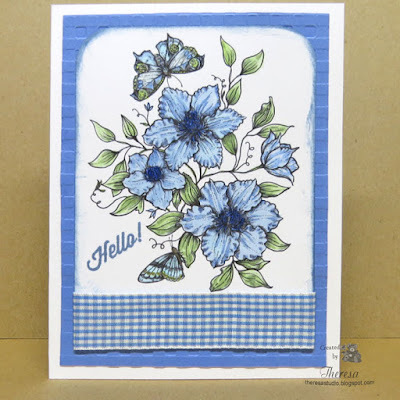 I have had the Repeat Impressions stamps since August 2015 ...I know because I used them on a card posted on my blog then. 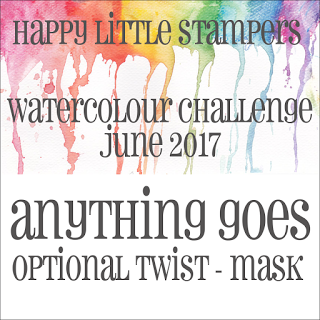 Retro Rubber: Challenge #65 Feeling Sketchy. RI Stamps are from 2015. Hello! 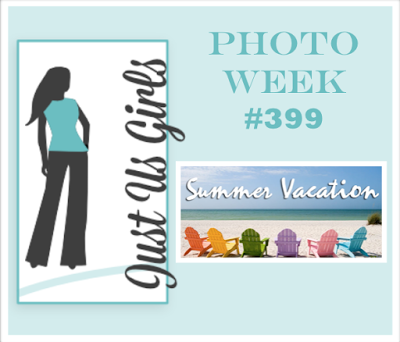 My card today was inspired by the Photo/Color Inspiration challenge at The House That Stamps Built. I created my background on watercolor paper using Distress Inks and a Water brush. 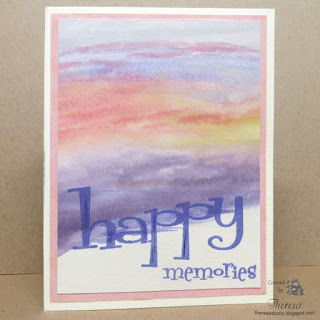 Using Repeat Impressions stamps I added the sentiment with SU ink. This panel was attached to patterned paper and the an Ivory Card Base. 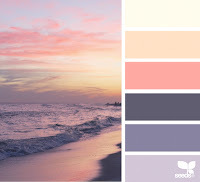 I was trying to achieve a look of a tropical sunset that brings back Happy Memories (inspired by the photo). 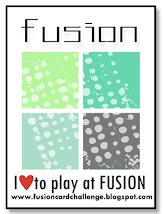 Mod Squad Challenge: Colorful Creations-use a lot of colors on your project. Hello! 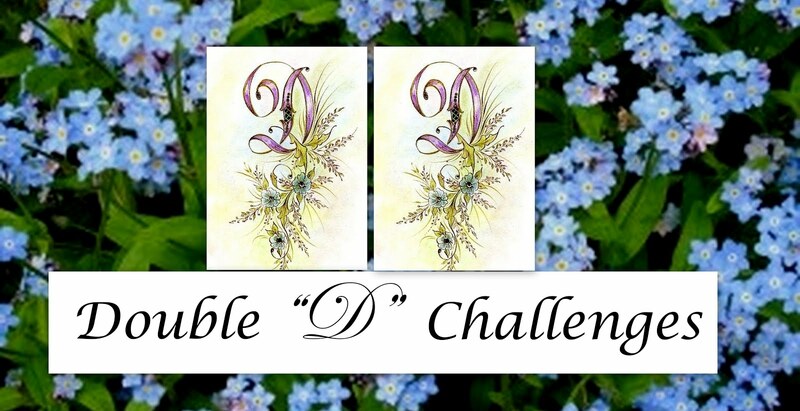 Today's card was inspired by the Blue and White challenge at Double D Challenges and the June Bug challenge at Power Poppy. I began with the blue and white check ribbon from my stash and the digital printout of Power Poppy Climbing Clematis image. I colored the flowers and butterflies with Blue and Green Copics and distressed the edges with a Distress Ink. I added the ribbon to the image and attached to a Gingham embossed Blue Mat and a White Card Base. 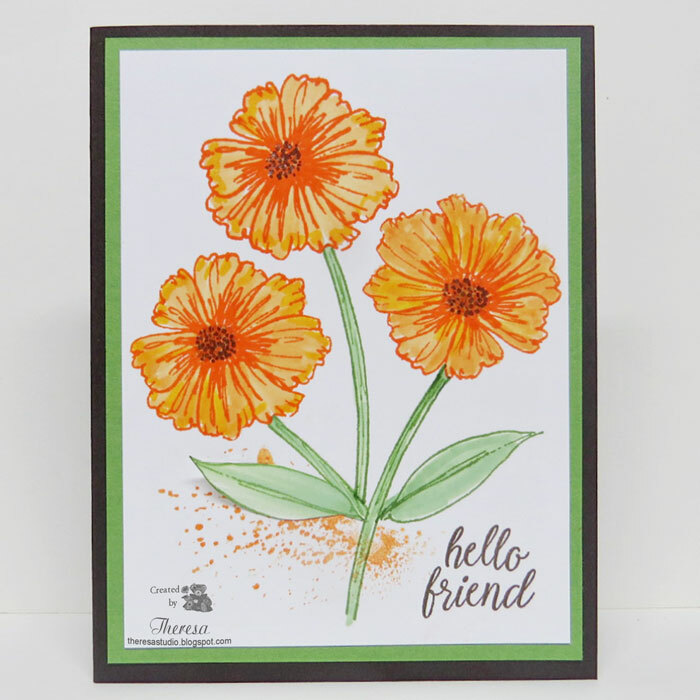 The Hello sentiment is from Power Poppy Dahlia stamp set. Yes, there are blue butterflies and blue clematis....I researched the colors on Google to be sure. 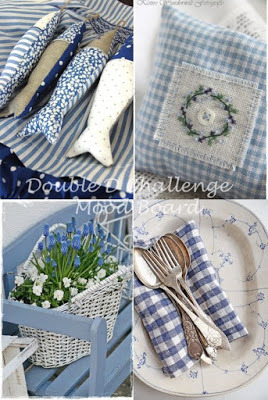 Double D Challenges: Blue and White Challenge. See Mood Board below. Inspired by the colors and patterns. 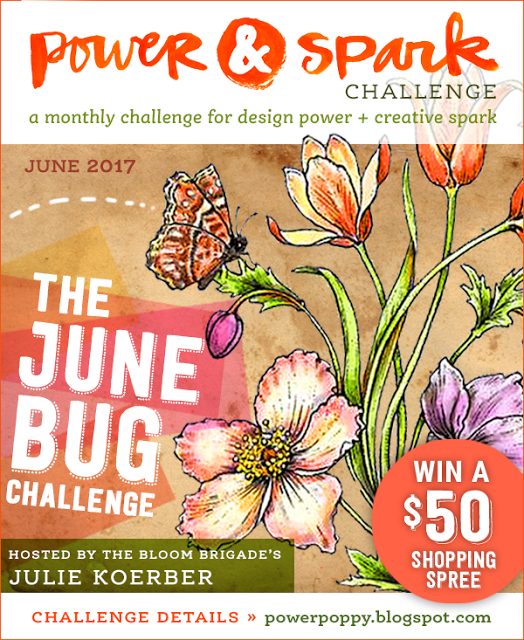 Power & Spark Challenge: The June Bug Challenge-use a bug on your card. Mine has 2 butterflies. Hello! I'm back with a Father's Day card for my DH-the Dad of my Teddy Bears. He loves his bears and his red wine....so I kind of combined the two. Used a precut step card with a wine bottle stamp (won in 2014) from Repeat Impressions and other stamps from PSX and SU. 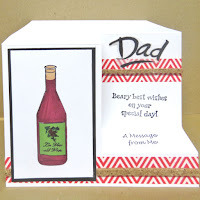 Heat embossed "Dad" on velum using Black EP and used Memento Black ink for the rest of the stamping. 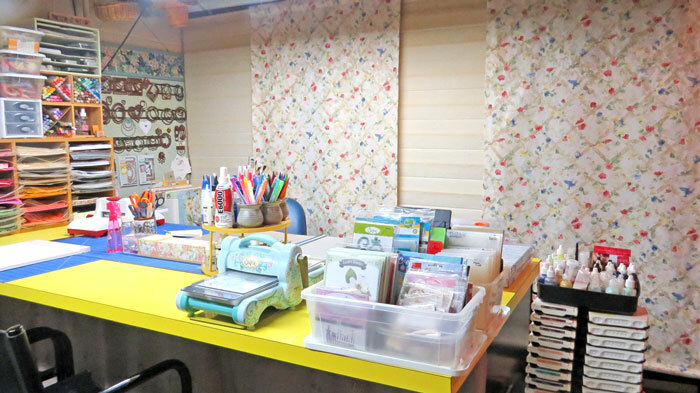 Finished with Chevron Stripe Washi tape and some strips from Cork. 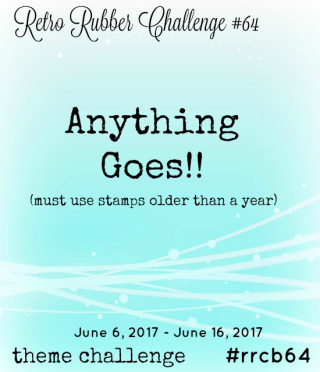 Retro Rubber Challenge: #64 Anything Goes with Stamps one year or older. 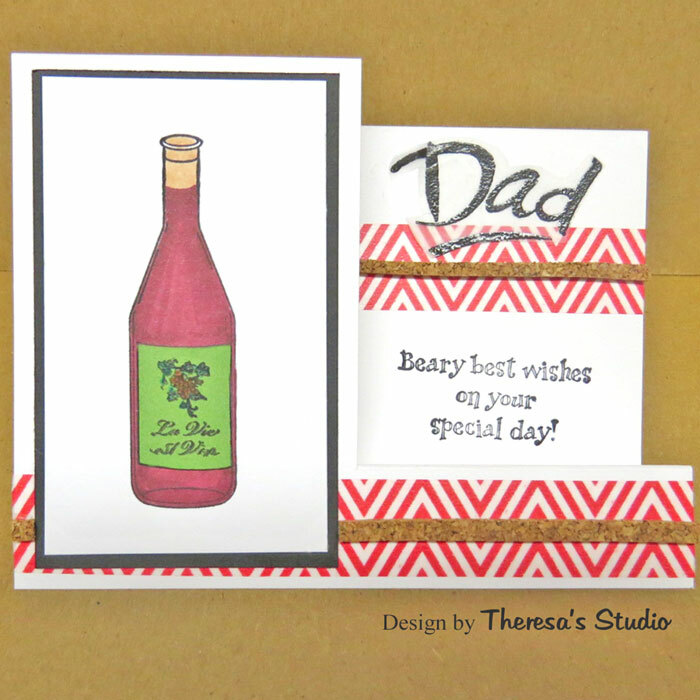 Wine bottle stamp from 2014 win, PSX Dad stamp from 1999 and SU stamp from 2000. Cards In Envy: You're the Man Challenge. Can must be masculine.